Southern African leaders meeting in Mozambique were Friday left scratching their heads after Zambia’s president Michael interjected the chairperson’ speech to joke about a serious border dispute between Malawi and Tanzania. SADC leaders and delegates were further confused when Sata refereed to the King of Swaziland as the King of Southern Africa. 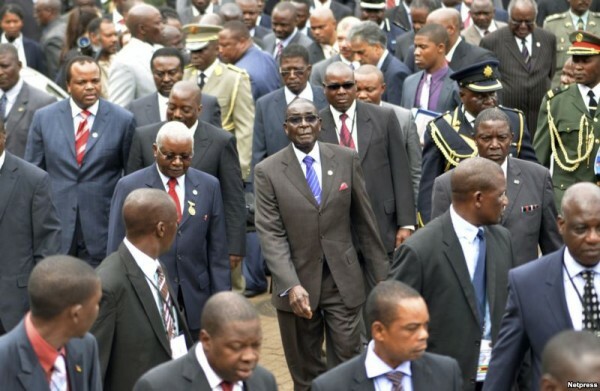 Leaders of 15-nation Southern African Development Community (SADC) are meeting in the Mozambican capitol, Maputo for two days ending today (Saturday). Zambia’ Michael Sata who was elected in late 2011 made his first speech to the full summit on Friday. When opening the summit earlier, Mozambican President Armando Guebuza said the regional bloc will also have to confront a brewing border conflict between Malawi and Tanzania. The dispute erupted after Malawi in 2011 issued an oil exploration licence to British firm Surestream Petroleum to prospect for hydrocarbons in Lake Malawi, part of which borders Tanzania. Tanzania wants Malawi to halt the exploration to allow for talks to resolve the dispute. But Sata saw an opportunity to joke. “If they start fighting we are going to host the refugees,” he shouted from his seat. Malawi’s President Joyce Banda refused to comment on the dispute, saying the two countries were talking. “Officials from Tanzania and officials from Malawi are meeting. It would be wrong of me to pre-empt their discussions,” she told AFP. Later, when Sata was invited to make his first speech at the SADC summit, Michael Sata gave a mild attack on Europe. He said even though there were some troubled parts of the region, it had, however, continued to show that it can employ African brewed solutions for African countries. He said the region needed to remain strong in fighting against imposed foreign solutions that he said did not have the interest of the African people. During his speech Sata kept on ‘jokingly’ referring to King Mswati of Swaziland as king of Southern Africa. MMD changes name to Mother of Multi-party Democracy?